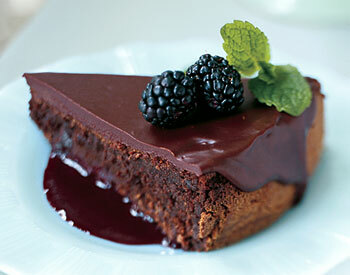 Simply Southern Girl: Flourless Chocolate Torte.. I have a good friend, Joy who is allergic to wheat gluten. She often makes this cake, and it is amazing!!! I of course had to share on my blog, as I recently found out, I had several followers who are also allergic to wheat gluten.. Joy usually does it without the coulis, or with strawberry instead. Preheat oven to 350°F. Brush 9-inch-diameter springform pan with margarine; line bottom with parchment. Stir 1 2/3 cups chocolate chips and 3/4 cup margarine in medium saucepan over low heat until smooth. Whisk in cocoa and espresso. Cool 10 minutes.